What happens when Art meets Hospitality? It WOWs, of course! 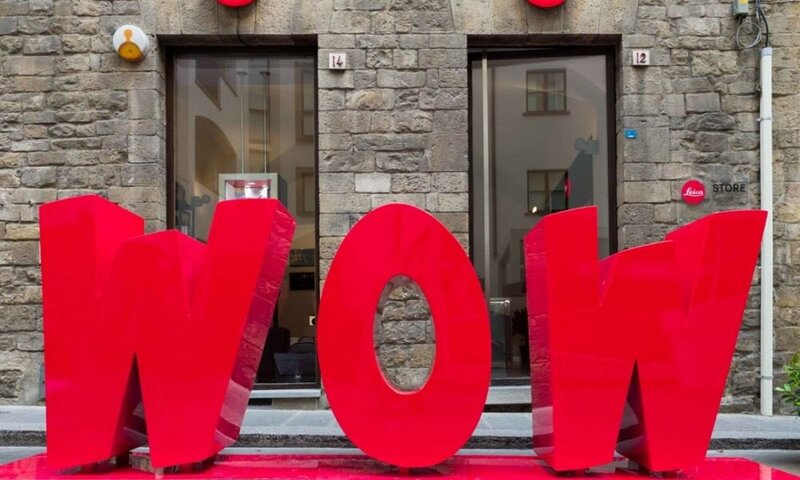 As if the city of Florence doesn’t already add to the Wow factor of Italy, the Simone d’Auria WOW installation has taken residence at the Gallery Hotel Art for a short time. Lungarno Collection, a group of artsy hotels owned by the Ferragamo family has Firenze tourist in awe. Just a few steps from the breathtakingly beautiful Ponte Vecchio, “WOW. The windmill for energy” is on display. Simone D’Auria took the time to express the importance of clean energy, renewable energy such as wind energy. Inside you can see windmill like art accompanied by photos from the artist. While outside of the Gallery Hotel Art you can see the gigantic pinwheels and a 3D “WOW” which is becoming a must selfie tourist attraction. I’ve toured the Campania and Lazio region of Italy, including Napoli, Avellino and Roma. I would absolutely love to add Tuscany. Florence is on my list of must visit destinations. On display until December 31, 2016 and free of charge to enjoy; WOW. The windmill for energy is a must see! Next: How Much Coffee Should You Really Be Drinking?